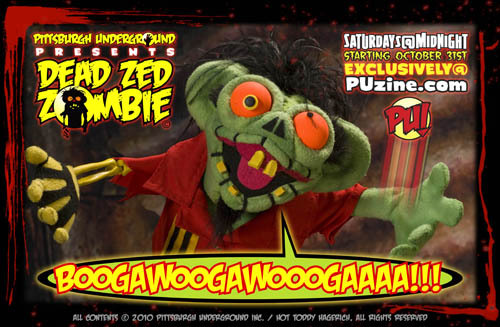 Pittsburgh Underground: Announcement: Dead Zed Zombie Premieres Halloween Night at Midnight!!! Announcement: Dead Zed Zombie Premieres Halloween Night at Midnight!!! Hey kids! It's been an intense week with LOTS of tricks and treats being cooked up for you right here at Pittsburgh Underground! First, we brought you our monthly PU Pulp Posters, now starting on Halloween at midnight we bring you the first in our ongoing Dead Zed Zombie webisodes! Zed's been cooped up for far too long and has recently discovered the internet! Check out the premiere episode right here and then every Saturday at midnight! BRAINS!! !